The following is the ninth message that we received in Egypt this past March 2012 over Equinox. You can find our other messages on our website at www.alunajoy.com under the "Articles for Personal and Planetary Transformation" link. It might be a good idea to read them in order as each message builds upon the previous one. We are sharing this message here with you just as we received it, in present time, with very little editing. We do this for a very important reason. We know that the messages that we receive are not just for our groups, but are for others as well. The Atlantean/Egyptian Masters and the Star Elders assure me that the message and the corresponding energy will be transmitted to you. So as you read this, you might want to imagine that you are with us. Also, always view the photos on the website that we share, as photos also hold some energy of the sites. They are activating our solar plexus with a new energy body. They are saying among all the other things we understand about the solar plexus area, it is also the seed place, the genesis from which all things are birthed. The seed place is also the womb in a woman. They are activating in us (and those reading this - with your permission) a wisdom or a knowledge or an ability to learn to create new dimensions. I don't remember feeling so happy last year in this temple. The Immortals, Spirits, Guides, and Star Elders were very serious last year; weren't they? There is a big difference now: they are very happy. They are giving us that creative force now. It's coming through these four creator Beings into their laps and flowing into us. So are you feeling it now? They are pulling energy in from the Great Central Sun. It's coming down from the Great Central Sun and hitting our solar plexus, where we all have been feeling some mild discomfort. (speaking softly) Okay, we have attracted some attention from the guards. . . This is where we play dumb tourist. We are going to move around a little bit and feel the temple to dispel any possible suspicion about what we are doing. I think we received what we came here to receive. (Aluna) They were putting energy in our solar plexus, right about where I have been hurting for the last 24 hours. The solar plexus is the seed of creation, and they were putting something there to activate the energy we received at the Isis Temple the day before. The energy in the Isis Temple was pure undefined energy - with nothing in it but pure energy. Then today the four creator beings defined the energy ever so slightly, and this has created a foundation stone from which a new world can be built. Last year the Star Elders told us all about this energy, but they didn't give it to us then. We and the Earth were not ready for it. Now they are giving the energy to us. (and to those reading this) The Immortals cleaned us out, and the Hathors helped us dump out our garbage at the Temple at Kom Ombo, along with some lost Atlantean souls. If we still carried the old, negative energy and it had not been cleaned up, we could not be allowed to hold this new energy. It would be dangerous to do so. Now the time is right, and the planet is ready. Last year the Star Elders, Immortals, and Guides told us all about this need for cleaning up the old, negative energy of the Earth. Last year they told us about it, and this year we have been prepared every step of the way. Sekhmet cleaned us out and gave us a job to do. 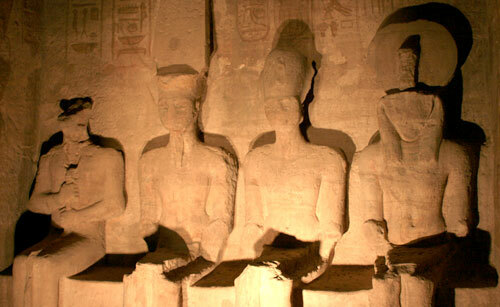 Then we went to Edfu and unknowingly gathered up and cleaned up part of the misqualified energy from Atlantis. The next day we went to Kom Ombo, and we dumped out and released the negative energy, which left a big empty space inside of us. Next, we went to Isis, where they filled up the empty space. Do you see how each day is building upon the other? They have called us here for the purpose of clearing out the old, negative energy in order to be able to receive and qualify the new, pure creative energy - not just for ourselves but for the entire earth. It sounds small when I say this, but I can feel the enormity of this project. For this reason, we were all feeling rather tired. We have been working hard. We have reclaimed, recycled and received a lot of energy thus far. Today we are qualifying this new energy. But we needed a starting point, an anchoring orientation in a new dimension. We needed this because this pure energy is like a vast ocean without a horizon. This pure energy is like the universe without any differentiating planet or star. One of the Creator Gods gave us this orientation point today. We can build a new dimension now with this new orientation point. We are filled up with pure energy, and this is why we all felt worn-out after our visit. They have qualified this pure energy just a little bit to get us going in the right direction - to offer us a foundation from which to build. But the rest of the creating is for us to do. I think they are preparing us for what we need to do next. They were happy to see us - probably because it is the right time to give us this creative energy, whereas before it wasn't. Again, this is why they were happy this year. One last important point, in the next world, the focus will be on Ether which will allow us to manifest easily using the elements of creation of the earth plane: Earth, Fire, Water, Air, Ether. With Ether added, we will be able to manifest anything, time travel, anything our minds can imagine. Do you know what YOU would like to create??? Post fun note. . . On this day our electronics acted up. . . my iPhone compass would not give us directions. It just spun around and around like it was looking for a direction. When we left the temple it quit doing this.